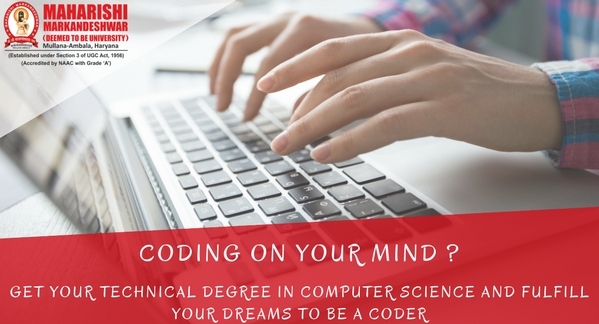 Ever since you got into your senses, if you dreamt of becoming a coder then definitely it is the right place for you. B.Tech in CSE is the most desired degree nowadays as the IT sector is becoming a huge market in this shrinking world. Before choosing this field one must be very clear about their goals and aspirations. Because that zeal is what will take you forward. WHAT ALL IS COMPUTER SCIENCE ABOUT? Computer science is the study of the theory, experimentation, and engineering that form the basis for the design and use of computers. Computer Science & Engineering is the practical and technical approach to computation and the systematic study of the feasibility, structure, expression, and automation of the methodical procedures. They can be divided into a wide variety. Computational complexity theory (which explores the fundamental properties of computational and intractable problems) are highly abstract. Computer graphics emphasize real-world visual applications. Interest plays a crucial role while going for a career and further jobs. If you are interested in this particular field then move forward. Selecting a specialization according to interest is making a good future. If you are choosing a career just because someone suggests you this may end you up in getting a satisfying career but not what you dreamt of. Advances in Computer and Information Technology over the past few decades have brought about a revolution in science, medicine, education, business, and entertainment. If you wish to be part of the future revolution and that is why you want to study Computer Science. The idea of studying Computer Science came to us as soon as we started considering our career options: We have been around computers from an early age and have absorbed ourselves in them ever since. We have particularly interested in some of the computer field (like Java,c++), research into breakthrough technologies such as “Direct Note Access” has shown me the amazing possibilities that could be achieved with the right ideas and knowledge behind them. My interest in Computer Science comes from my view of it as a challenging and creative subject, I am particularly eager to study software engineering and computer graphics. So follow your dreams and achieve your goals. Are You The One? Looking for the Right Mentor to take you to the next level.